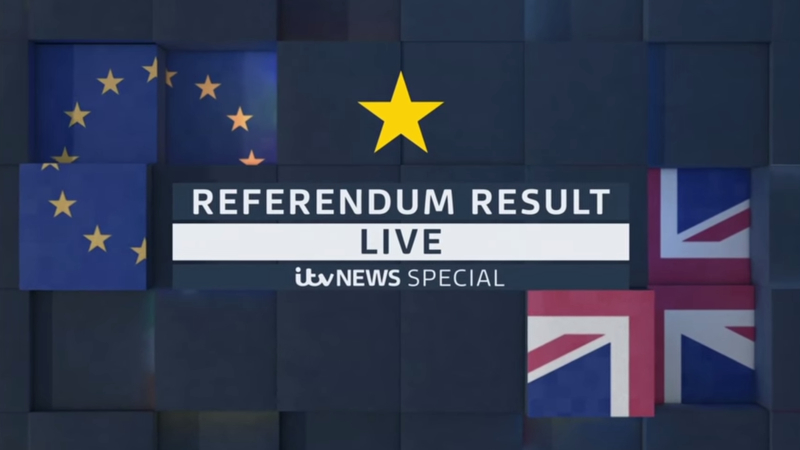 The United Kingdom went to the polls on Thursday to decide the nations fate in the European Union and late into the night something unexpected happened… scrambling media around the world to cover one of the biggest stories that is sure to unfold over the next weeks, months and years. 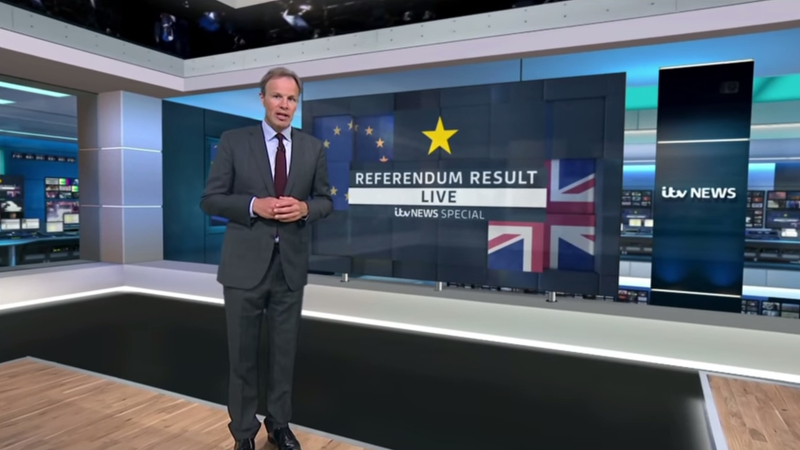 The British networks all had vast coverage plans for the night, but various U.S. channels quickly shifted to cover the unfolding story. 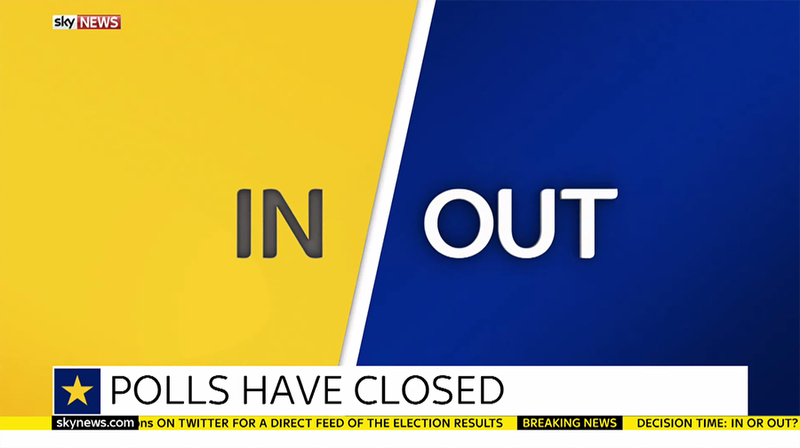 Here’s a quick recap of the coverage from a visual standpoint. 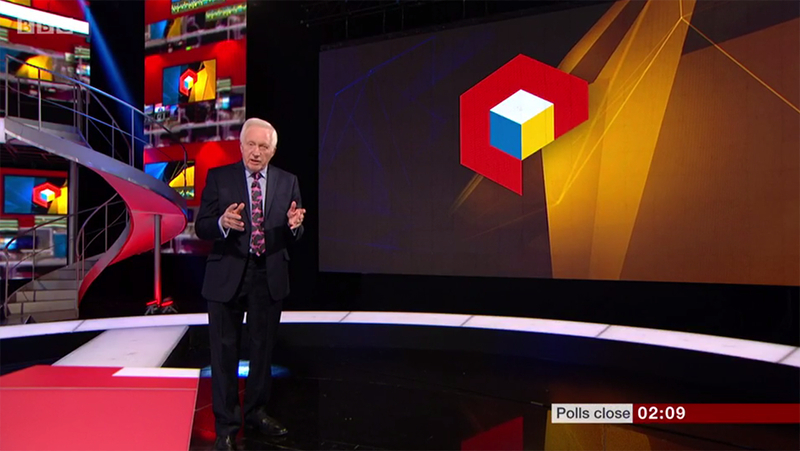 BBC used its large election studio, which was also used in 2015, for its coverage. 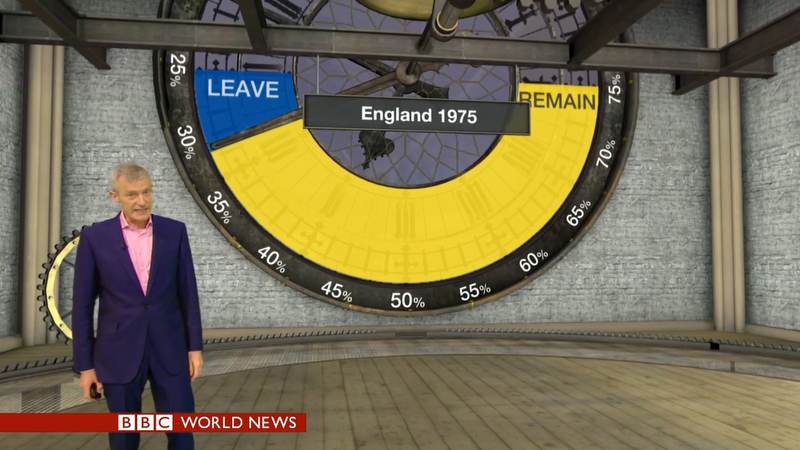 Virtual played a key part of BBC’s analysis, which even included a 3D Big Ben for breaking down data. 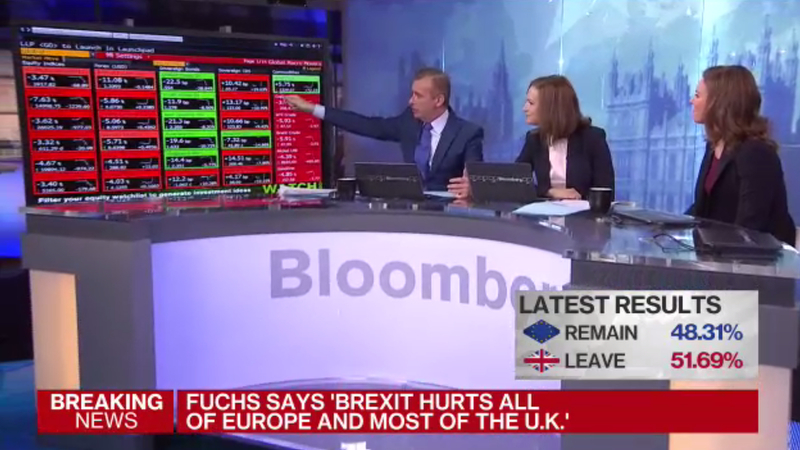 Bloomberg, which normally airs programming overnight from the U.K. anyway, featured a panel of experts in its London studio, with many shots of the Bloomberg Terminal showing the impact of the vote. 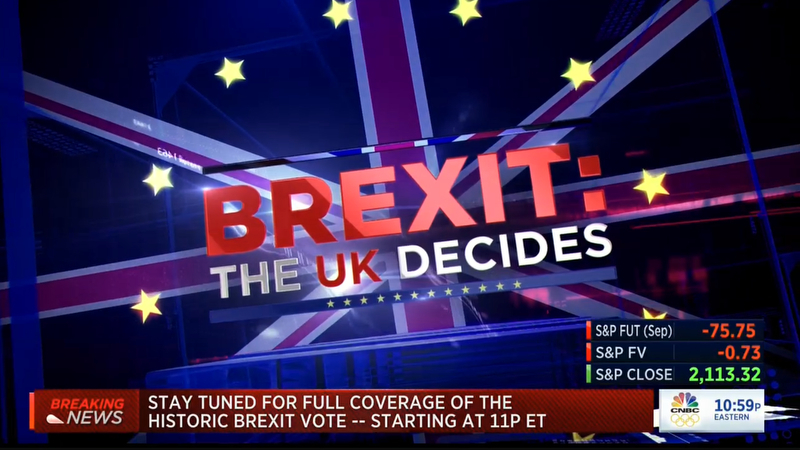 CNBC aired a special report with anchors from bureaus around the world, which interrupted normal overnight programming. 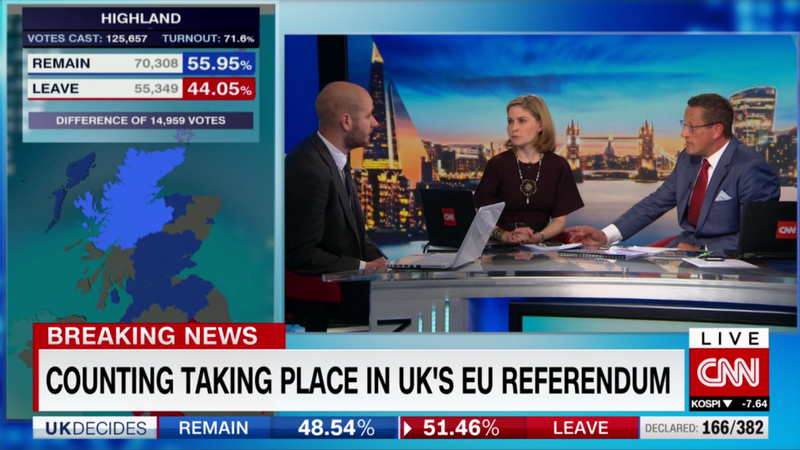 After having Richard Quest drive around Britain in a camper to check the pulse of voters, he and others originated coverage from CNNI’s London studio. 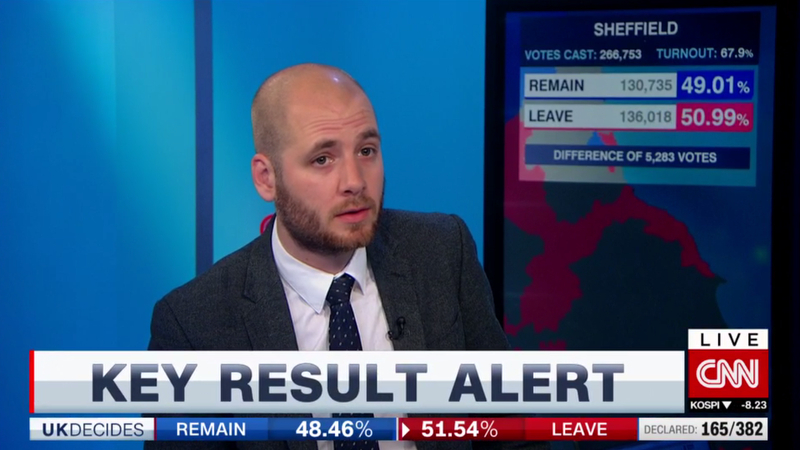 Similar to its U.S. presidential primary coverage, CNN featured “Key Race Alerts” on its lower third, as results came in. 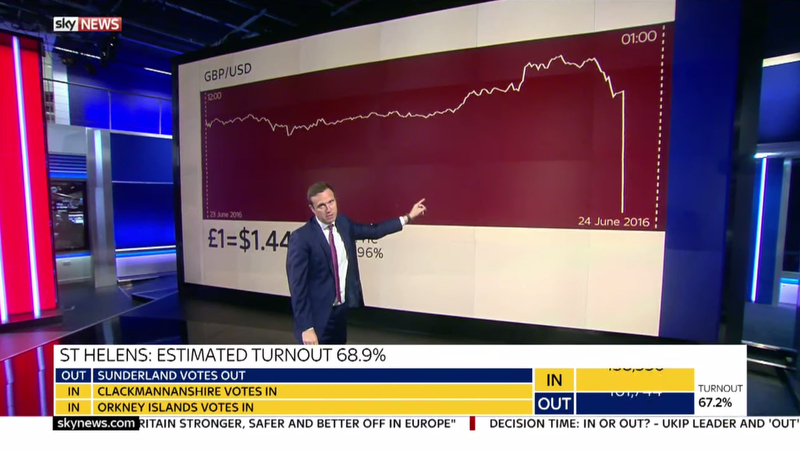 FB originally simulcast Sky News coverage, then began producing its own special, borrowing Sky’s data feed. 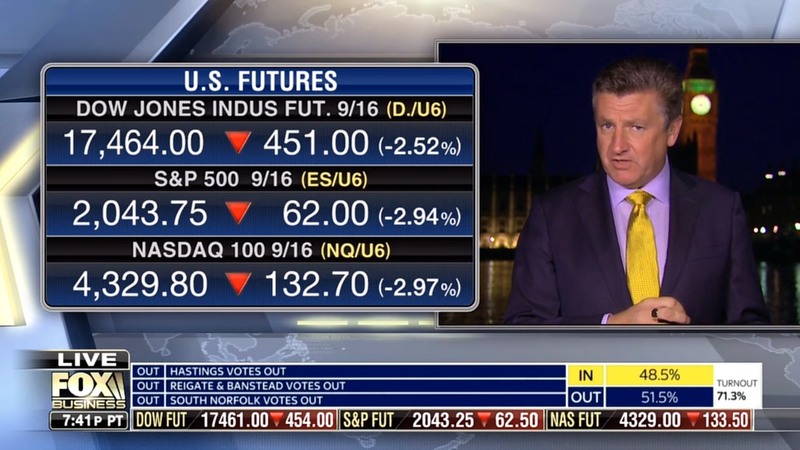 Fox News broke into taped programming at various points with updates on the unfolding vote, but left Fox Business handle the bulk of the coverage. 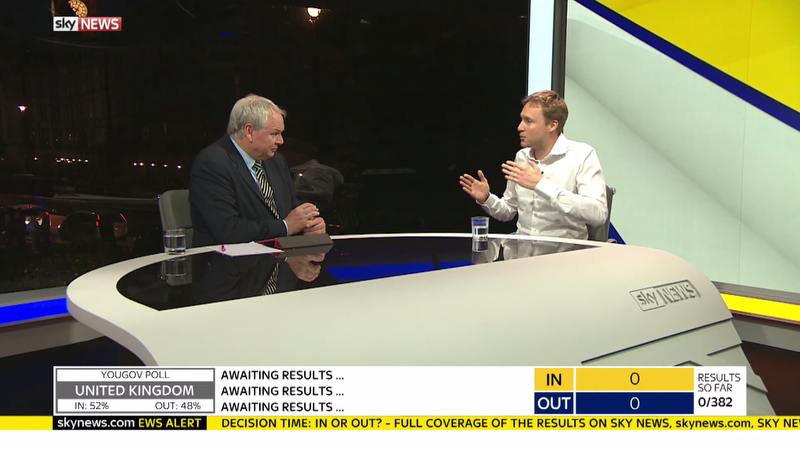 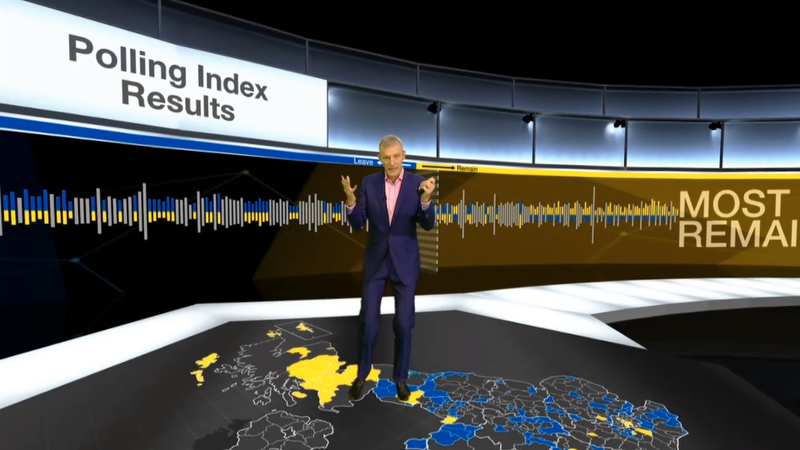 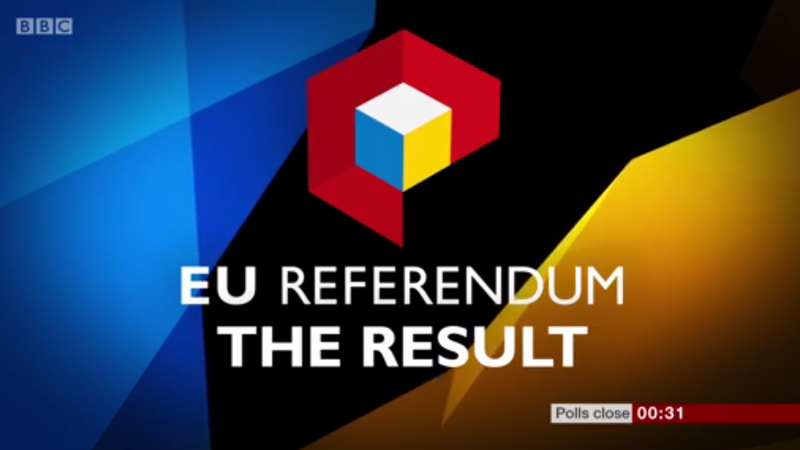 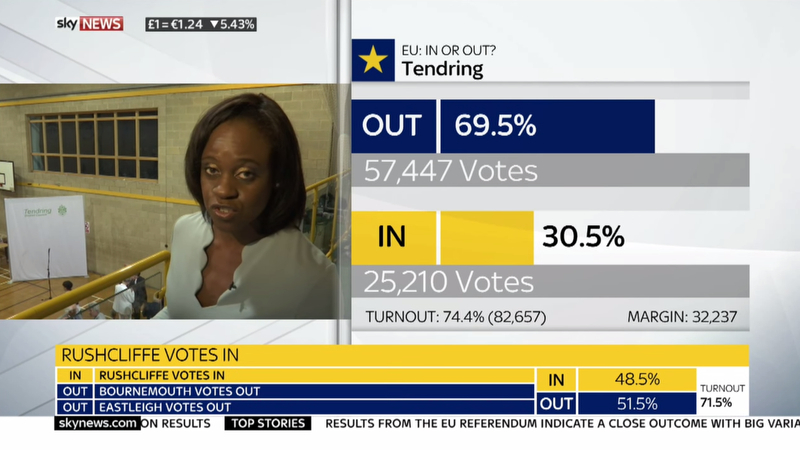 ITV’s coverage used a reworked virtual studio, similar to its 2015 election coverage, with EU regalia placed around the scene. 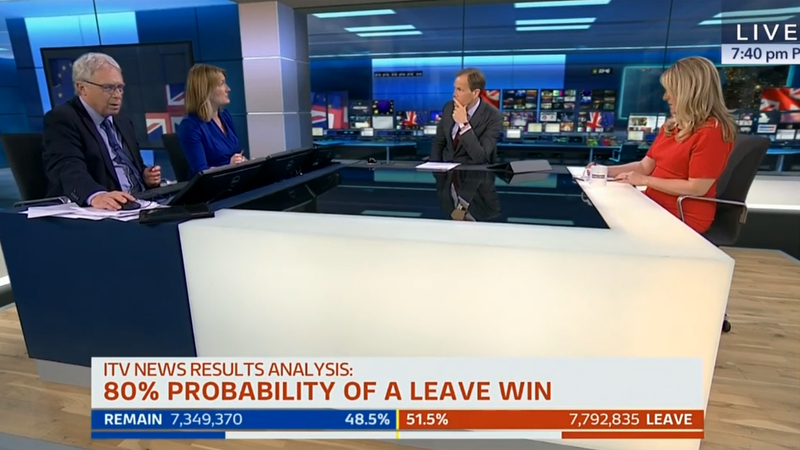 Graphically, the network had a slim strap with results throughout the broadcast, with many guests and pundits in studio. 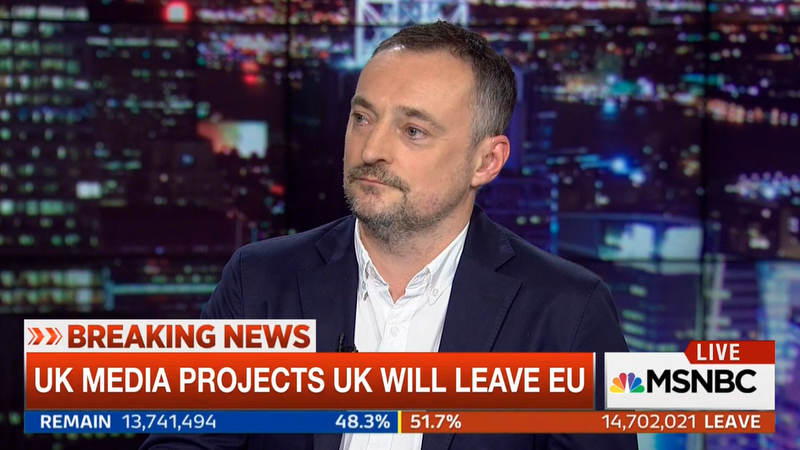 After it was clear the story was bigger than originally expected, MSNBC ditched its late night replays of “Maddow” and “The Last Word,” instead mixing ITV coverage with panels in New York. 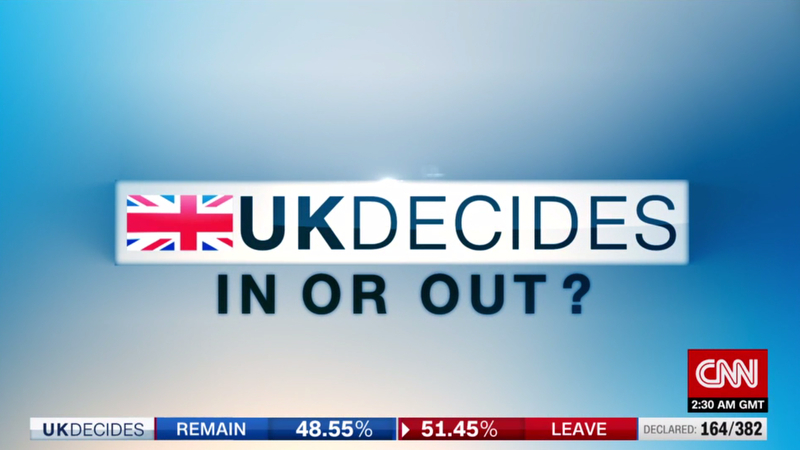 MSNBC borrowed ITV’s graphics, placing it under the normal lower third. 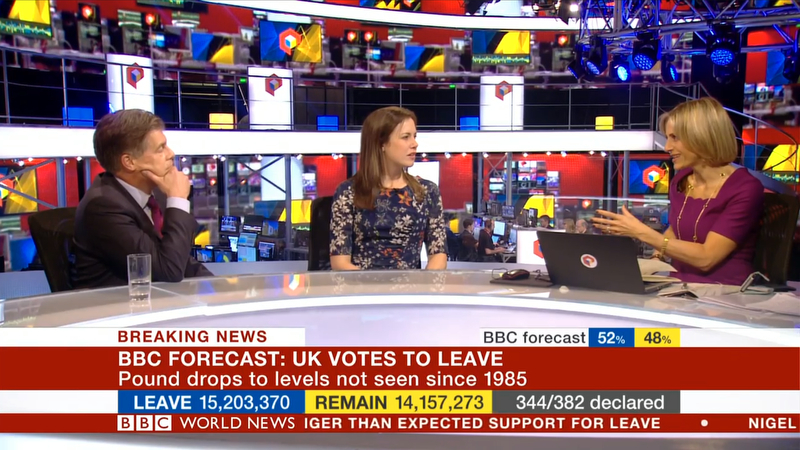 Sky News utilized a small studio along with its monster video wall for its Brexit coverage. 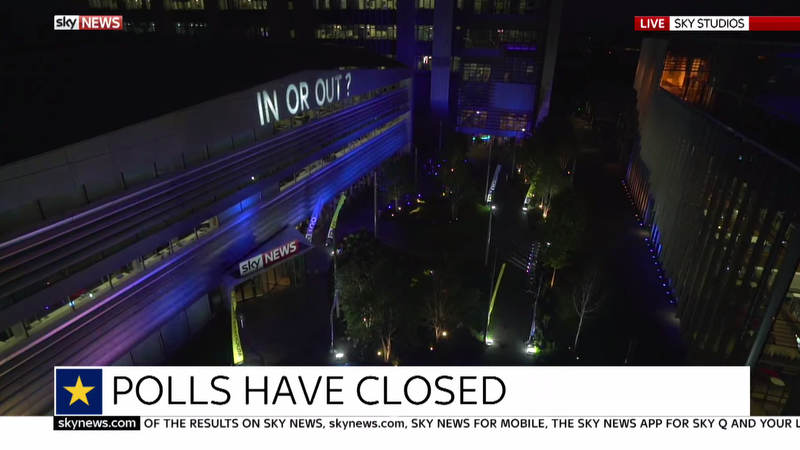 Borrowing from NBC’s playbook, Sky had a large outdoor part of its building lit for the coverage, almost like “Democracy Plaza.” During the main intro, the words “In” and “Out” flashed on the building, with various flags and lights color coded to match the election graphics.